When I initially planned this book, the goal was to write a book that adapted Markham’s soil amendment and other gardening techniques (from across several of his books) to a modern garden. 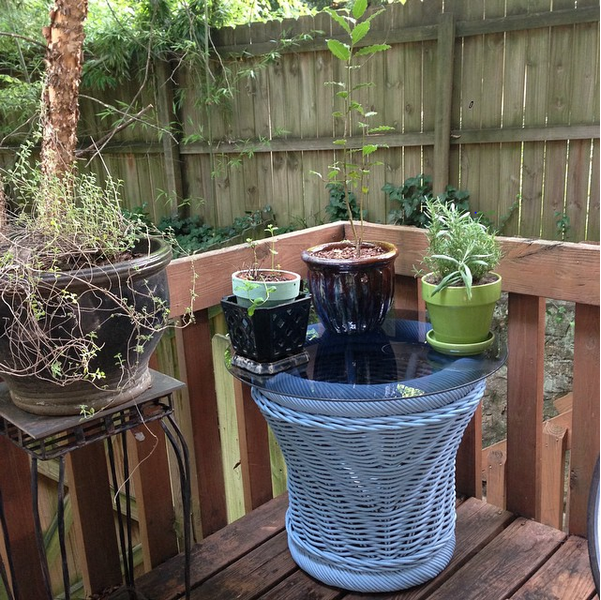 This idea comes with a variety of challenges for an apartment dweller, having to do with the space to experiment in (apartments typically aren’t known for their sprawling gardens) as well as my desire to not incur my landlord’s wrath by digging up her yard. Another potential challenge for this project is the fact that I don’t live in England (or a similar climate), which is where Markham’s intended audience lived. Then there’s the issue of sunlight, which is something I’m told is important to plants. My ‘garden’ (currently a few potted plants on a porch table) is far from being a sunny spot. My yard is filled with trees and bamboo plants, which makes it beautiful and cool in the summer, but not the greatest for growing lush planters full of fruits and veggies. So why continue with the book with all these obstacles in the way? First, because a challenge is fun, but mostly because because it lets me explore a new direction for my work that ties in with the gardening theme. We’re in an interesting place as a culture at the moment, where eating locally is an option rather than the only option, and where it is actually cheaper in some instances to eat food produced elsewhere (there are many pieces on the politics of this and on its relationship to income inequality, which I’m sure I’ll explore at some point as a necessary part of writing about local food). When I wrote my first book, I wrote it with an eye towards faithfully modernizing the recipes–meaning sometimes I had to use ingredients that weren’t available locally (quince, for example, was nowhere to be found in Iowa City while I was writing). This time, I’m going to honor the approach I tend to use in my own cooking, and one that connects me with generations upon generations of cooks who used what was local and in season (or what was local and had been preserved from another season) because that was what was available. So this time, instead of recreating the exact recipe, I’ll use it as inspiration and recreate it with what I can find from local producers (or grow or forage myself). This is the cooking that Europeans who first came to this country would have engaged in with the new ingredients and different climate. In the South, focusing on English food seems appropriate because England was a major colonizing force in this part of the country. The recipes I experiment with moving forward will be done with an eye towards understanding English food as it existed in the colonial period (and perhaps a bit later). This means discussing Markham-era foods and recipes (and understanding how or whether Markham’s writing influenced colonial diets), but also seeing how those foods evolved over time in the southeastern United States. The gardening theme isn’t going away either–it will just be a smaller portion of the book, experimented with and discussed alongside other local food-related subjects. I’ll continue to research Markham’s approach to gardening, and I’ll continue to move planters around in my yard to make things grow (and use whatever I’m able to grow in the book’s recipes). I’m hoping to flesh out these gardening ideas further once I have a bigger, sunnier plot to call my own (perhaps once I start writing book three!) I can’t wait to learn more about the history of my new home, and to share that history with you! Happy reading! P.S. : this topic necessarily means discussing this country’s legacy of slavery and the killing and displacement of First Nations. I wanted to put a footnote about it here because many readers still deal with the ramifications of those legacies, and I don’t want to give the impression that I’ll just focus on happy and shiny food blogging and ignore the way those foods intersect with history. This book is mostly about food, but it’s also about food within our culture, so I’ll be exploring all the ways those two intersect!